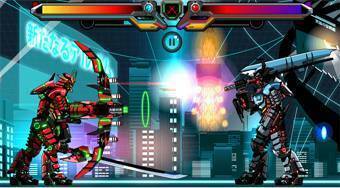 Do you like Battle Robot Samurai Age? Share it with your friends. Battle Robot Samurai Age is another piece of a fabulous fighting game in which it will be your task to build a combat samurai robot from each component. First, assemble a complete robot, test its functionality during training, and then start one-on-one combat with the other robots.